Peter was a neighbor and good friend of well known folk artist Garnet McPhail. Garnet taught Peter to carve and he would often take the people interested in folk art to visit Peter and act as an interpreter for Peter and his wife who are both deaf. Peter does the carving and his wife Lisa does the painting. He has been carving since 1991, and has become popular with collectors throughout Canada and the United States. He carves a variety of subjects including roosters, animals and people, and has participated in several Nova Scotia Folk Art festivals. He was the featured artist in 2014. 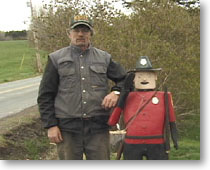 The mountie standing beside Peter is also available for purchase at the Black Sheep Gallery. We discovered it on a fence post near Garnet's house. Ref: A Joyous Vision - Contemporary Folk Art in Nova Scotia, Nova Scotia Folk Art Festival Society, 1995.